While almost all projects are challenging and fun (what can I say, we have some good clients), we sometimes get lucky and get to work on projects that come with something special and are worth our while in a different kind of way – a more personal way. One of these is the Annual Report for the Wake County Boys & Girls Clubs. It’s apparent that the Wake County Boys & Girls Clubs boasts a wonderful reputation. However, before we started working with them, I didn’t fully appreciate just how much they do in our community. 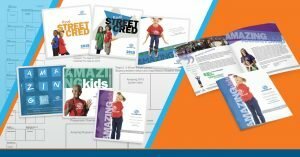 Providing art direction and design for the Annual Report not only presented me with the welcome challenge of creating powerful imagery for a powerful cause, but it gave me the opportunity to dive deeply into what the Boys & Girls Clubs is really all about. When I began to understand the transformational growth this organization achieves with the kids in our community, how could I not be moved to do all that I could to create the best message possible? One of the greatest obstacles became selecting which images to use in the Annual Report. As I sifted through hundreds of photos taken throughout the year, the value the programs bring to the kids was clear and what was abundantly clear is how much fun they have doing the range of programs and activities that are offered. From tech seminars for young women, music and video production, to healthy cooking workshops and government leadership programming, the hardest part was deciding what moments to leave out. When initially presented with a 32-page report, the charge to build an image library seemed to be the least of my worries. However, I now see that even 32-pages is just a sneak peek into the enriching, life-changing experience offered by the Wake County Boys & Girls Clubs every day. As we begin to work on the 2016 annual report, I am reminded of the pride in what we accomplished as a team from 2015. I am sure the level of joy and pride we felt when we received the final print of the 2015 Annual Report will only grow exponentially with anticipation for what is to come in 2016. Playing a part in sharing the amazing accomplishments of the Wake County Boys & Girls Clubs with all that make their programs possible, is a special experience that you do not often get with other clients. I’m totally amazed at what the Wake County Boys & Girls Clubs can do for each child with only $7.50 a year. With incredible clients like this, the work it takes to illustrate their greatness in a few graphics or a single report can hardly be considered work. It is a privilege.